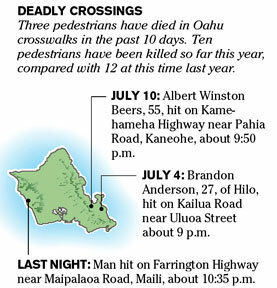 Police are investigating the third pedestrian fatality on Oahu in 10 days. All three victims were hit while in a crosswalk. The latest victim, a man, whose name and age were not available, was crossing Farrington Highway near Maipalaoa Road in Maili about 10:35 p.m. yesterday. Police said he was headed mauka and was hit by a four-door 2003 Volkswagen in the inside Honolulu-bound lane. The victim was taken in critical condition to the Queen's Medical Center where he died. The driver of the vehicle, a 24-year-old man, and his passenger, a 17-year-old boy, were not injured. Police said speed was a probable factor, but have ruled out alcohol as a cause. There have been 27 traffic fatalities this year, compared with 40 at this time last year.